Before using Cryonite® equipment, read and understand these safety guidelines. Before using this equipment, please read the Safely Working With Cryonite section. Cylinder Transport. Follow any local safety guidelines provided by your local carbon dioxide (CO2) supplier regarding transporting and handling CO2 cylinders. Eye Protection. Wear protective goggles when applying Cryonite in situations where CO2 snow may come into your eyes (i.e., when applying above head level). Skin Contact. Do not allow the CO2 snow generated by Cryonite contact your skin for more than a few seconds. Ventilation of Treatment Area. When using Cryonite, ensure good ventilation in the area being treated. Avoid keeping your head close to the floor when applying large amounts of CO2 in small spaces (e.g., under a bed). Thank you for choosing Cryonite! This section demonstrates the components of the Cryonite equipment and basic assembly instructions. Cryonite is different from conventional insecticides; therefore, the application procedures vary from those regularly used by Pest Professionals treating various structural pests. To make the most effective use of this valuable alternative pest control technology, read and understand the techniques and tips included in this User Manual and other training materials provided by Cryonite (e.g., DVD, service guidelines). The trolley is shipped in 9 pieces, ready to assemble in 3 simple steps. Mount the wheels using the M6 × 10 mm screws and washers (included). Use a 6 mm hex key to tighten the screws firmly. Attach the upper part to the wheel base. Pull the small knobs at the end of the upper part. Attach the upper part to the wheel base and press until you hear a click and the knobs have hooked on to the wheel base. Firmly tighten it with the strap. Find a supplier of CO2 gas — Cryonite customers are kindly asked to arrange an agreement a suitable local supplier of CO2 gas. Please check the yellow pages under gas suppliers or welding equipment, and you should be able to find lots of alternative suppliers in your area. A normal price to re-fill a 20 lb cylinder is $20-30 depending on how you negotiate. The prices in Europe are about twice those in the US. Requirements on the CO2 cylinder Gas — You can use any pure CO2 gas in cylinders with room temperature (FYI: sub-zero cryo-gas gives a poor effect). A technical grade of 99.5% purity or better is preferred and works best with the Cryonite equipment. Contact Cryonite USA if you can only find gas of lower purity. Cylinder: The cylinder MUST be equipped with a “dip-tube,” otherwise, the Cryonite lance will not function properly! 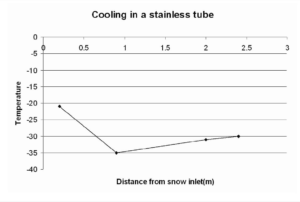 Cylinders without dip tubes result in the Cryonite lance failing to produce CO2 snow. Usually cylinders with dip-tube don’t come in many sizes. Our own trolley is made for a size we find to have a good ratio of weight/usage time. 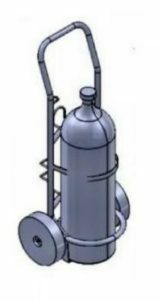 It is a 13.5 liter, 10 kg net CO2, diameter 20.5 cm (the trolley can handle max 23 cm), and height to shoulder (below the valve) 52-62 cm. The valve adds about 15 cm. Available sizes vary between countries. Coupling: The gun is connected to the cylinder with a hose, which we also supply. The connection on the cylinder needs to be the right one, for the hose to fit. Our standard hose fits the European DIN 477 nr 6 / SN 219505 Type 7, as well as the British variant thereof British Standard 341 Part 1 (.860 in x 1/14 in W) / BS341 No. 8. This standard is the most common throughout the world. We can alternatively supply a hose for the US standard, i.e. CGA 320. Get Training — To be most effective and efficient in using Cryonite it is essential users are trained in the various techniques that make this freezing technology so valuable in controlling many types of structural pests. When NOT applied as designed, insects and spiders contacted by Cryonite CO2 snow can and do survive. View the Cryonite training videos available on www.cryonite.com and read the User Manual. Other training materials may also be found www.cryonite.com. Practice Application Techniques — Practice makes permanent. Because CO2 is not an insecticide, it is easy to practice application techniques anywhere, at any time. 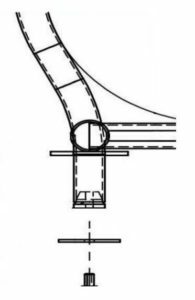 These techniques are described in greater detail later in this User Manual. Distance from the surface during application is very important. Be sure to hold the tip of the lance an appropriate distance (8 to 10 inches) away from the target being treated. Application volume should be controlled. Avoid application with the trigger fully engaged. Best results occur with less pressure. The layer of snow applied is critical. Too little or too much snow covering the target pest can allow it to survive. Make sure that the cylinder is tightened to the trolley. Ensure that hose to the handle connection is secure and that the locking ring is in the locked position. Check that the nuts are securely tightened. The nut on the front edge of the nozzle must also be tight; tighten this only by hand. Open the valve on the CO2 cylinder fully. The equipment is now pressurized! Push the safety lock button on Lance handle forward to unlock. Ready! Jet Nozzle is only needed for specific applications. The Jet Nozzle should be inserted in the standard nozzle. First unscrew the front-end nut. Insert the Jet Nozzle. Refit the nut (fig.). Only use hand-power. If you insert it and snow is still present in the standard nozzle, the Jet Nozzle may become plugged. Remove the Jet Nozzle and let the snow evaporate. After use, the cylinder tap must always be shut off. Empty hose and lance of gas by pressing the trigger. Relock the safety lock button on the Lance. Note that the Lance should only be released from the hose once the hose has been emptied of gas. 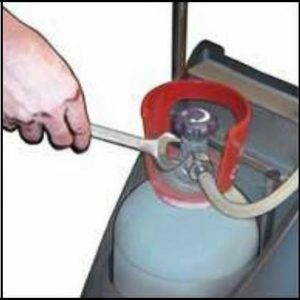 Ensure that the tap on the gas cylinder is closed. Loosen the connecting nut at the cylinder with a box wrench. Loosen cylinder straps. Replace cylinder. Tighten straps. As consumers, workers, producers or employers, we all need to be aware of how our daily lives can impact the environment. Although pesticides are valuable tools that have helped society produce more food, improve public health and protect our dwellings from damage, they are toxicants and should be used carefully and judiciously. Treatment of most pests, such as cockroaches, bed bugs, ants and spiders, are more effectively controlled by trained pest professionals. Professionals with knowledge of pest identification and biology understand the conditions and harborages in which pests thrive and can then ensure their treatments — both chemical and non-chemical — are applied where they can be most effective. Pest Professionals in the Structural Pest Control Industry have looked to various alternatives to residual treatments as part of IPM programs and a number of these strategies and technologies have found regular use. Cryonite is one such alternative, and its use can reduce the amount and type of insecticide treatments necessary to control a number of troublesome pests, including bed bugs, stored food pests, spiders, and cockroaches. Cryonite works by freezing insects and other pests by employing the cooling properties of CO2 (carbon dioxide). Liquid CO2 is transformed into exceptionally cold dry-ice “snow” and causing the death of pests by freezing. As applied with Cryonite, CO2 is nontoxic, leaves no residues, and is completely dry after application. Because Cryonite works by freezing, the risk of pesticide resistance to the treatment is not a Pure CO2 presents no risk of contamination, even in sensitive industries. CO2 Gas Cylinder (typically 10 kg). 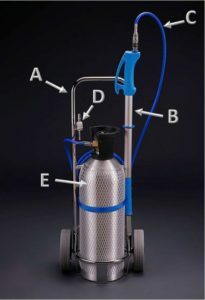 The Trolley (A) has Straps for the liquid CO2 cylinder, one high pressure Hose, one Grounding Cable for static electricity reduction, and a Jet Nozzle. It also has clips to hold the Lance, Jet Nozzle, Spanner, and hooks for winding the Hose and Grounding Cable. The secret of Cryonite is found in the nozzle of the Lance (B) which has been developed to create the optimum quality of CO2 snow. The ergonomic telescopic Lance has a variable trigger mechanism allowing Cryonite delivery at different rates to suit the situation. A security lock for Components of the Cryonite® System the trigger is also found on the handle by the trigger. The Hose (C) provided with Cryonite is about 12 feet long and has connections for the Lance on one end and for the cylinder on the other. It is temperature and pressure resistant. The Jet Nozzle (D) is designed to produce high speed snow and is useful when it comes to application in hard-to-reach areas such as cracks or voids. It also can provide a significant flushing effect to chase insects from hiding within harborages. DO NOT use the Jet Nozzle for regular Cryonite applications. A build-up of static electricity is possible when working with Cryonite. The steel Grounding Cable is used for discharging static electricity away from the Cryonite equipment. This cable only needs to be used when applying Cryonite near electronics (integrated circuits). See the Working Safely with Cryonite section on page 13. It’s important to use the right type of CO2 cylinder (E) — it must be equipped with a dip tube inside! The dip tube is necessary because Cryonite uses the CO2 in liquid form, otherwise it cannot produce the CO2 snow needed for freezing pests. Inform your CO2 gas supplier that you must have cylinders with dip tubes. If problems with snow production occur, check the cylinder first. CO2 cylinders come in various shapes and sizes, depending on gas supplier and country. Consult the supplier. Liquid CO2 in the cylinder enter the Lance which converts it to the particles of dry ice “snow” emerging from the nozzle. About half of the CO2 will become cold gas necessary to propel the snow from the nozzle tip onto targeted pests and into pest harborages. The CO2 snow made by Cryonite is a mixture of different-sized particles in ratios proven by research to provide the optimum lethal effect upon contact with target pests. When the CO2 snow hits surfaces at normal temperatures, it evaporates (sublimates) and becomes CO2 gas. The required heat energy necessary for evaporation is extracted from the immediate surroundings in contact with the dry ice snow. When the snow is in contact with a target pest, naturally, the heat energy is taken from the body of the pest. Water in the pests’ cells then crystallize into ice, therefore, killing the insect. Cryonite’s snow particles are optimized for clinging the pest’s exoskeleton allowing the time needed for deeper penetration of the freezing effect into the pest’s body, increasing it’s effectiveness. The dry ice snow only chills those surfaces on which it has direct contact. If a pest is insulated from direct contact with the snow by a layer of debris, dust, or food particles, the maximum freezing effect may not occur and the pest may survive. For this reason, use of a vacuum to remove exposed pests and debris prior to application of Cryonite often is highly beneficial for many pests situations. NOTE: This is why nitrogen is not as effective as carbon dioxide despite its colder temperatures (-196 °C/-320°F)—as nitrogen converts from liquid to a gas, it floats on a layer of gas creating an insulating barrier. Nitrogen therefore takes almost no energy from the surface contacted. Cryonite’s snow particles make direct contact with the exoskeleton of target pests as well as surrounding surfaces. Proper Snow Layer Thickness. The snow layer applied should not too thin or too heavy. A thin layer of snow is not as likely to generate enough of a freezing effect to kill the target pest. A heavy snow layer will act as an insulator by trapping a layer of gas between the snow particles and the pest’s exoskeleton, thus protecting the pest from freezing. 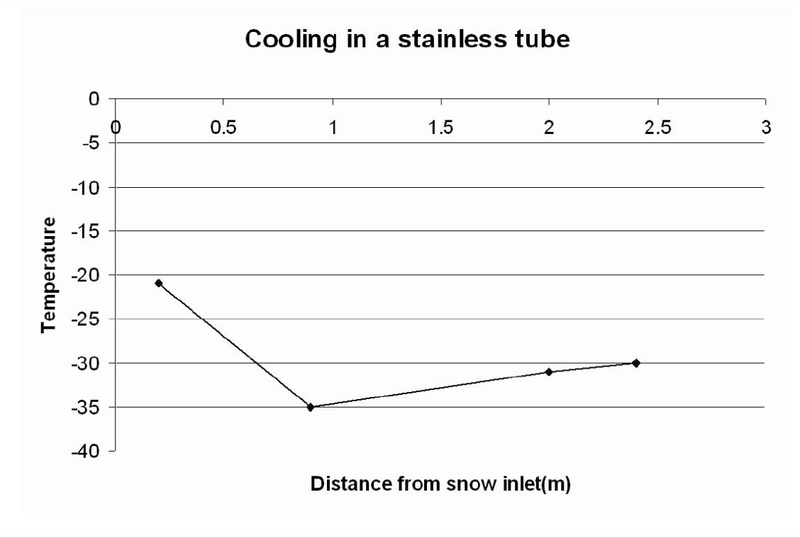 Heavy snow layers also can cause unnecessary deep chilling of materials, possibly leading to a moisture or material problem, and also wastes CO2. Evaporation Time is Critical. The layer of dry ice snow applied should evaporate within 20 to 30 If the snow layer evaporates too quickly or takes too long to evaporate, pests can and will survive the treatment. The Jet Nozzle is for Treating Cracks. DO NOT leave the Jet Nozzle permanently attached to the end of the Lance! The Jet Nozzle is designed for applying the snow into cracks and crevices. The force generated by the Jet Nozzle can actually knock pests from exposed surfaces and scatter them around without killing them. In addition, leaving the Jet Nozzle attached to the Lance will commonly cause the Jet Nozzle to “fuse” so tightly to the Lance that it cannot be removed. 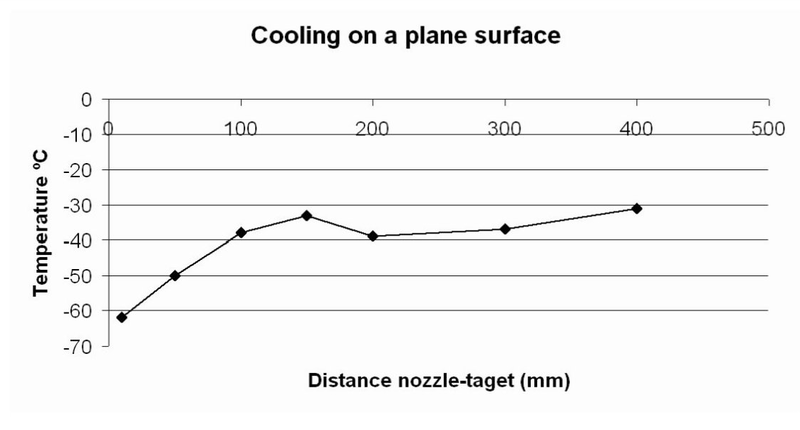 Nozzle Distance from Surface. When using the Lance (without the Jet Nozzle!) to treat exposed surfaces, the ideal application distance from the tip of the Lance to the target surface is about 8 to 10 inches. DO NOT hold the Lance too close to the surface because you can dislodge pests and scatter them. Holding the Lance too far away can require more application to achieve the desired thickness of the snow layer (due to evaporation of snow from the Lance to the surface). Apply Using a Sweeping Motion. Apply by sweeping the nozzle back and forth slowly several times over the target area, instead of passing over the are just once. Reapply Treatments as Needed. Some insects (and insect eggs) have the capability to resist cold temperatures, and the treatment may only result in a temporary knockdown effect. Larger insects, such as American cockroaches, may be more resistant to the freezing effect of Cryonite. For best results, it is therefore important to reapply treatments to such insects immediately. Where significant pest activity is evident or wear insect eggs (i.e., bed bug eggs) are involved, applying Cryonite snow over the same site several times—each following complete evaporation of the snow layer—can maximize results. Avoid Over-Application. Apply what is needed for the situation at hand and resist the temptation to apply a “little” more. Such over-applications will not improve the effectiveness of the treatment. It is best to apply two or three treatments within a short time interval in between each than to apply heavier amounts of the dry ice snow. Practice, Practice, Practice. Good application techniques come through practice which improves the effectiveness of treatments with Cryonite. Cryonite is especially effective against smaller insects which can be more easily killed by freezing. This technology is used most often by pest professionals to control bed bugs (Cimex lectularius) and various stored product beetles and moths. Cryonite works effectively against other pests as well such as many web-building spiders (i.e., cobweb weavers, Family Theridiidae), German cockroaches (Blattella germanica), fly larvae in drains (i.e., moth flies, Family Psychodidae; phorid flies, Family Phoridae) and some mites found in buildings (Class Acari). Pest Professionals have also used Cryonite to eliminate wasp nests (i.e., paper wasps, Polistes spp.). A limitation of Cryonite is that it works by contact only — it does not leave any residual residues. This fact, however, is also a significant advantage, along with it being non-pesticidal, because Cryonite can be used in sensitive areas where residual insecticide treatments may not be prudent or allowed. Examples include schools, day cares, many areas of hospitals (e.g., patient areas, patient rooms, operating suites), assisted living/nursing care facilities, food processing areas, pharmaceutical areas, pet stores, and zoos. Because Cryonite works only when the dry ice snow directly contacts a pest, it is important to be sure pests are not protected by layers of dirt, dust, grain debris or other materials. Vacuuming areas prior to treatment with Cryonite removes both dust and debris as well as many of the target pests. Remaining pests (and in the case of bed bugs— eggs) in the area are then more exposed to direct contact by dry ice snow. The colder air and release of CO2 resulting from the evaporation of dry ice snow seeps into cracks and will flush pests such as cockroaches and bed bugs into the open. Bed bugs respond strongly to CO2 as, to them, it signals the presence of a host. It is recommended that you reapply Cryonite to areas with bed bug activity about 15 to 20 minutes following the initial application to contact and kill bed bugs flushed into the open. Application of Cryonite into cracks and voids (use the Jet Nozzle tip) where German cockroaches are active can flush these insects into the open where they can be removed by vacuuming or treated directly with Cryonite. It is recommended to vacuum areas with pest activity with dust and debris which cleans the area. The freezing effect provided by Cryonite can also result in encrusted debris and soil to be loosened. Adding the Jet Nozzle to the Lance for a 2nd pass can then cause such debris to release from the surface where it can be removed by vacuuming. Experience has shown that application of Cryonite into drains down to the trap to kill fly larvae can freeze and loosen wet slime and debris on the sides of the drain making the drain easier to clean with a brush. Effective pest management results through following basic procedures and application techniques. Every pest situation is different so Pest Professionals may need to change up the basic steps below to fit the situation at hand. Focus inspections on sites and conditions where the target pest is most likely to be found. Remove dust, debris and exposed pests using a vacuum prior to Cryonite application. Apply Cryonite to cracks, voids and surfaces where pests are found or suspected. Avoid application by depressing the trigger all the way. Best results occur when applying at lower pressure, depressing the trigger about half-way. Use monitoring traps and follow-up inspections to evaluate whether pest activity remains. Repeat the above procedures in areas where pest activity continues. Although Cryonite technology is non-toxic, some risks may be involved with transporting CO2 Cylinders and the use of Cryonite equipment and application of CO2. Carbon dioxide (CO2) is an essential chemical in the atmosphere. Carbon dioxide is common component in the atmosphere and is essential for plant life on this planet and therefore animal life as well. Carbon dioxide gas is widely used in the food industry and other industries. 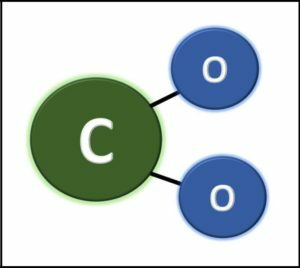 High concentrations of CO2 are hazardous to human and animal health, but the low concentrations of CO2 resulting from the use of Cryonite are not typically high enough to be considered dangerous to people, pets or animals (other than the target insects, spiders, mites, etc.). Typical HVAC systems in buildings recycle enough air within rooms to prevent CO2 concentrations from accumulating. A small risk exists if Cryonite is being applied in enclosed spaces without adequate ventilation, such as some crawlspaces, plenums, compartments within large equipment, pipe chases, or similar locations. It is possible for concentrations of CO2 reach a high enough concentration be a concern in such enclosed locations especially near the floor where the heavier CO2 may collect in low-lying areas. Precautions should be taken when using CO2 in enclosed spaces — primarily ensuring good ventilation. Use a fan to ventilate the space with fresh air while applying Cryonite and have another person standing by as a precaution. When working in manufacturing, food processing and other commercial buildings, the facility may have safety procedures that need to be followed when working in a “confined space.” Be sure to consult the customer, before entering any tunnel, crawlspace, or similar space with little or poor ventilation to apply Cryonite of perform any other pest control service. The dry ice snow emerging from the Lance has a temperature of -110°F (-78.5°C). Direct contact of the dry ice snow with skin can cause freezing injuries similar to burns. Information regarding potential skin contact is found in the CO2 Safety Data Sheet provided by your gas provider. Transport of CO2 Cylinders is governed by various federal, state, and local regulations. You local gas supplier is the best source of information regarding the transport of CO2 Cylinders in vehicles. Transport of CO2 Cylinders is described in the CO2 Safety Data Sheet provided by your gas provider. It is recommended that Cryonite equipment and CO2 Cylinders be secured in an area separated from the driver. When moving the Trolley around during service, ensure the CO2 Cylinder is kept tightly belted to the Trolley. Make sure that the Trolley cart is secured so that fragile parts aren’t damaged. The Lance is especially at risk for damage during transport. Always disconnect the Lance from the Hose and Trolley before transporting in a vehicle. Store the Lance in a padded case and in a location where it is protected, such as the passenger compartment of the vehicle. The high-pressure Hose should also be disconnected from the CO2 Cylinder prior to transport. Other issues need to be considered when using Cryonite. The Lance and Nozzle. The end of the Lance, near the Nozzle, can get very cold when using the equipment and is indicated by visible frost on the Nozzle. Allow the frost to evaporate before unscrewing the Nozzle and switching to the Jet Nozzle. Insulated gloves may also be used when switching out the Nozzle. CO2 Cylinders. Depending on the type of CO2 Cylinder to be used, always keep in mind the weight of the cylinder. Use proper lifting techniques when handling Cylinders to avoid potential muscle strains or injuries. Ask for help with handling Cylinders when necessary. Dry Ice Snow. The dry ice snow emerges from the Lance at a temperature of -110°F (-78.5°C). The snow also comes out of the nozzle at different speeds depending on the degree to which the trigger is depressed and whether the high speed Jet Nozzle is being used. Dry ice snow can bounce back from surfaces and hit the eyes, nose, or mouth as well as exposed skin. Contact with the face and eyes is especially possible when applying Cryonite at or above shoulder height. Wear gloves to protect hands from contact with dry ice snow. Wear safety glasses or goggles to protect your eyes. When applying at shoulder height or above the head (or if lying on the floor applying under equipment, keep Lance tip extended as far as possible away from your head and body. Stand at an angle to avoid particles of dry ice snow bouncing off surfaces or settling to the floor. If necessary, wear a dust mask or temporarily drape a clean cloth over your face to protect exposed skin during the application. Wearing a cap during application can also provide protection. Static Electricity. While working with Cryonite, the flow of CO2 can cause a build up of static electricity. A static discharge could affect and damage unprotected electronics (integrated circuits). The steel Grounding Cable on the Trolley is used when equipment needs to be protected from static charges. When using Cryonite near electronics (integrated circuits), connect the clamp at the end of the Grounding Cable to the machine or surface where the dry ice snow is being applied. Static Discharges and Dusty Environments. In certain environments where dust accumulates, such as grain elevators or grain storage bins, any spark — including a static discharge — can trigger a potential explosion, . If Cryonite is considered for use in such areas, consult the facility’s manager, safety director other similar authority to discuss potential risks and the suitability of using Cryonite in that area. Cryonite can be used in all types of industries and areas. Where it is used within a particular building will depend on the type of pest infestation encountered. Non-toxic and non-residual nature of Cryonite applications is highly advantageous for many of the types of structures/facilities listed below. Cryonite is used in restaurants to control cockroaches, stored product pests, and fly larvae in drains. 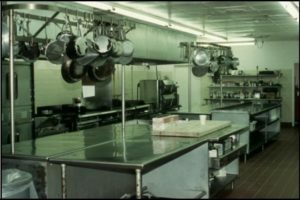 Food Handling Establishments — Primary target pests in restaurants, cafeterias and similar food areas include cockroaches, stored product pests and fly larvae in drains. Food Processing Facilities — Primary target pests include stored product pests, cockroaches, web-building spiders, and fly larvae in drains. Cryonite is beneficial in food processing to treat machinery infested with stored product pests because operations in the area do not need to be closed down nor does the area need to be vacated. Use of Cryonite to flush cockroaches into the open where they can be removed by vacuum is also important. 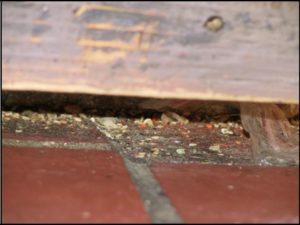 Homes/Apartments — Primary target pests are bed bugs but also include cockroaches and web-building spiders. Hospitals — Primary target pests are bed bugs and cockroaches as well as fly larvae in drains. Although patients are not required to be vacated from patient rooms during a Cryonite application, it is still good practice to do pest control services in an empty patient room or to remove infested furniture/beds to another location (such as a shower room) for treatment. Cryonite is a key tool for bed bug control in hotel and motel rooms. 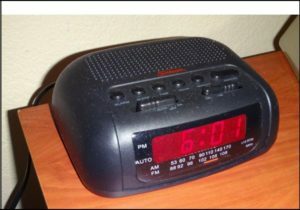 Hotels/Motels — Primary target pests are bed bugs and cockroaches as well as fly larvae in drains. For bed bugs, use of vacuuming and Cryonite applications followed by targeted residual treatments can often result in guest rooms being put back into service more quickly (depending on the level of bed bug infestation in the room). Drains. 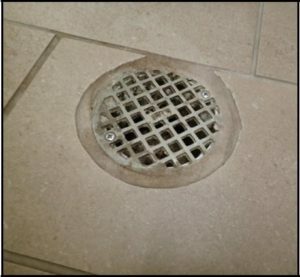 Application of Cryonite into drains can help control fly larvae breeding in the drains and also flush any cockroaches harboring in the top part of the drain. Remove the drain cap, extend the Lance tip into the drain a few inches and apply the dry ice snow as you remove the Lance. The freezing effect caused by the dry ice snow should help break loose much of the debris and slime coating the drain, thus making it easier to clean out with a brush. Fly larvae in drains can be treated with Cryonite. Using the Jet Nozzle. When treating voids, deep cracks, or cracks leading into voids, Cryonite should be applied using the Jet Nozzle. The added force provided by the design of the Jet Nozzle helps to push the dry ice snow deeper into such cracks and spaces. Avoid using the Jet Nozzle for treating open or exposed surfaces. DO NOT leave the Jet Nozzle attached permanently to the Lance! Smooth Surfaces. Insects and other target pests found on smooth surfaces (i.e., stainless steel, ceramic tiles) can easily be dislodged and spread to surrounding areas by the force of the dry ice snow emerging from the Lance. Pests blown off surfaces are unlikely to experience enough contact with the dry ice snow to be killed by the application. In such cases, apply Cryonite at lower pressure to minimize this issue. Cryonite may be applied to most electronics but care should be taken to avoid contact with circuit boards. Electronics and Electrical Equipment. Caution should always be used when working around electronics and electrical components. It is recommended that appliances and other electrical equipment be disconnected for added safety. The dry ice snow itself is dry, but as the surface temperature drops, condensation may form creating moisture which is potentially damaging to electronics and electrical components. Only the immediate surface is cooled, and the cooling effect doesn’t penetrate into the objects treated. The treated surface will warm quickly thus rapidly evaporating any moisture. 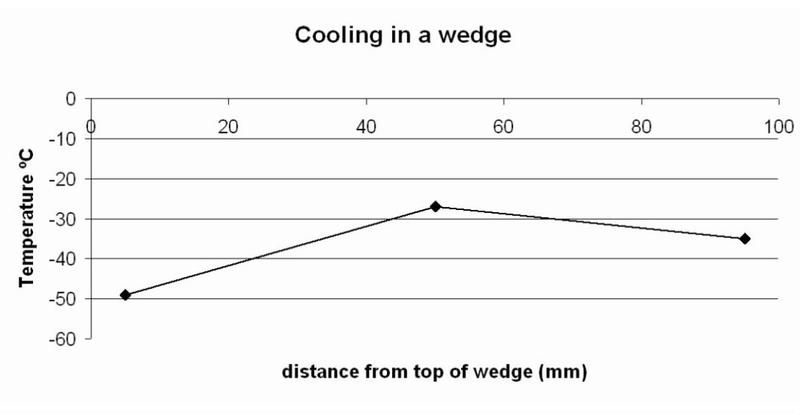 Occurrence of condensation is more likely when humidity is high (i.e., in a commercial kitchen). IMPORTANT: DO NOT use directly on sensitive equipment, screens or digital displays. Machines. Use of Cryonite to treat pests within machinery is a key benefit in facilities such as food processing. A single machine may be shut down, side panels opened for access, and Cryonite applied without needing to shut down operations nearby. Consult with the facility maintenance person/engineer when treating complicated manufacturing equipment. First, vacuum any grain dust, dirt, and insects from ledges, cracks, and similar locations. Apply Cryonite to all surfaces where pest activity is located. Use the Jet Nozzle to apply the dry ice snow into cracks and voids within machinery. Avoid direct application to electronics or other sensitive equipment. The Jet Nozzle can be used to clean cracks and to kill pests hidden within. Cracks & Crevices. Cryonite penetrates well into shallower If the cracks have debris, use the Jet Nozzle to push dirt and debris from cracks, vacuum and treat the crack again. The Jet Nozzle should also be used for maximum penetration to treat deep or large cracks and cracks that lead into voids (i.e., cracks in hollow block walls). Avoid using the Jet Nozzle when not needed — the quality of dry ice snow produced by the standard nozzle is better. The Jet Nozzle is for situations where deeper penetration of the treatment is desired. Voids. The concern when applying Cryonite directly into voids is the conditions and contents in the void are unknown. Target pests may be protected by debris, insulation or other materials and not be directly contacted by the dry ice snow. Application of Cryonite into voids, however, can cause pests (cockroaches, bed bugs) to be flushed from hiding into the open where they can be vacuumed or treated directly. Flying Insects. Cryonite is not designed for treating adult insects as they fly through a room, but it is effective when applied directly onto insect larvae and eggs. Small wasp nests are more easily treated with Cryonite than large nests. Wasp Nests. Nests of certain wasps, such hornets and small yellowjacket nests may be treated using Cryonite. 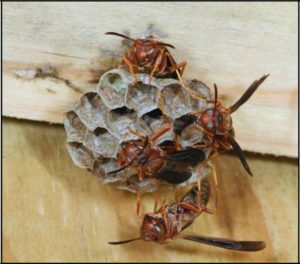 Treatment of exposed paper wasp nests with Cryonite may have mixed results depending on the distance away from the nozzle, the numbers of wasps present, and any breezes. The dry ice snow is likely to knock down some wasps immediately, but contacting all wasps before they begin defending their nest is unlikely. This may result in the applicator being attached by wasps during application. Paper wasp nests within voids are more easily treated with Cryonite. Social wasps that construct paper nests, such as hornets and yellowjackets, are better suited for treatment with Cryonite. Treatments are best done in the evening or very early in the morning during lowest points of nest activity. A protective bee suit should also be worn. Apply Cryonite at about half-pressure on the trigger directly into the nest opening for 30 seconds. Gradually increase pressure and allow the nest opening to fill with dry ice snow. It may also be beneficial to treat the outside of the nest (hornet nests). Remove hornet nests following treatment, place in sealed plastic bag and dispose of accordingly. Note: Yellowjacket nests in the ground or within walls may be too extensive to control using Cryonite. It may be useful, however, to apply Cryonite into the nest opening to slow down or disorient yellowjackets thus making it easier to treat the nest using residual insecticides. Stored product pests are readily killed by contact with Cryonite dry ice snow. Food-infesting Moths and Beetles. Dried food products infested with beetles or moths should be isolated and then discarded by the customer. Cryonite is used to treat cracks and surfaces on shelves and cabinets where infested materials were stored. Adult beetles, eggs, larvae and moth cocoons must be exposed to allow direct contact with dry ice snow. Vacuuming prior to Cryonite application is high;y recommended. Apply Cryonite directly to surfaces where activity was noted or suspected, into all cracks and directly to moth cocoons/pupae attached to surfaces on shelving and cabinets. Cryonite may also be used to treat the outside of packaging adjacent to infested products to potentially control any beetles or eggs on such surfaces. Cryonite is a key tool for use in bed bug management programs. Bedbugs. 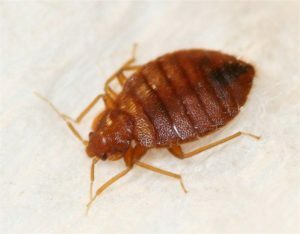 Bedbugs are difficult to control and require a multi-faceted, integrated approach for success. Cryonite has proven over the years to be an effective component of any bed bug program, particularly in sensitive environments such as hospitals, schools, offices, and public areas. Prior to Cryonite application, exposed bugs, dust, and debris should be removed using a vacuum. 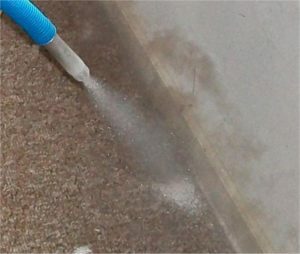 Using good application techniques, apply Cryonite to all exposed surfaces where bed bugs may be active, including along all seams and flaps of mattresses and box springs, cracks and surfaces within box springs, headboards and bed frames, baseboards, picture frames, lamps, nightstands and furniture. 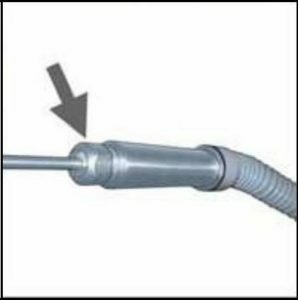 Voids with access openings, such as cable or pipe entering a wall, can be treated using the Jet Nozzle to serve a “flushing” effect to move bed bugs out into the open where they may be vacuumed or treated directly with Cryonite. Fifteen to 20 minutes following initial application of Cryonite, a 2nd treatment with Cryonite is recommended in areas with bed bug activity. The excess CO2 created by dry ice snow evaporation activates bed bugs and gets them moving. This second application can improve results in many cases. Follow the vacuuming and Cryonite treatment with applications of residual insecticides using accepted procedures used for bed bugs. Larger insects, such as these American cockroaches, may require 2 treatments with Cryonite to be effective. Cockroaches. Cryonite will flush cockroaches from cracks from the air movement created by the Temperature changes generated within voids due to Cryonite application can also flush hidden cockroaches into the open. Cockroaches chased from harborages can be vacuumed or treated directly with the dry ice snow. German cockroaches and smaller nymph cockroaches are most susceptible to Cryonite treatment. Larger species may be able to withstand the initial freezing contact with the dry ice snow and will need a 2nd application. Flushed or knocked down cockroaches should be removed by vacuum after Cryonite treatments to be sure that no cockroaches left behind might recover and return to harborages. Ants. Being small insects, ants are highly susceptible to Cryonite treatment. Because they are social insects and live in colonies, elimination of a colony using Cryonite is not likely. Cryonite is best used indoors to treat trails of ant workers after the colony has been treated directly with residual insecticides. This procedure is especially useful for trails in sensitive areas such as hospitals, day cares, etc. where residual insecticides are not desirable inside. Nests of the yellowjacket,Vespa vulgaris, were treated with Cryonite applied using low pressure for 30 seconds, then pressure was gradually increased. All the wasps within the nests were eliminated, and the nests are safely removed and destroyed. 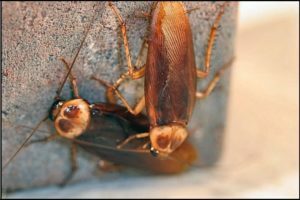 Successful tests have been completed to eliminate German Cockroaches, Blattella germanica, in factories, houses, and hospitals using Cryonite in combination with diatomaceous earth, a vacuum, and traps. A variety of tests have been performed to eliminate flour beetles, Tribolium spp) and various species of moths. All the tests demonstrated effective results in mortality of tested beetles and moths. A few successful tests have been done on the house cricket (Acheta domestica) in boiler rooms and other similar warm sites. Treatment first with Cryonite followed by physical removal with a vacuum provided satisfactory results in elimination of infesting crickets. A number of tests have been conducted to validate the effectiveness of Cryonite on a variety of different types of pests. The following provides a summary of a few of these tests. A number of laboratory and field tests with Cryonite have shown outstanding effectiveness in killing bed bug eggs, nymphs, and adults. 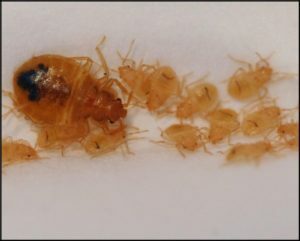 In a laboratory bioassay, bed bug adults, nymphs, and eggs were placed on scrunched cardboard to simulate crack/crevices inside plastic Cylinders. Cryonite was then applied as four bursts onto the bed bugs in the Cylinders. The number of dead adults and nymphs was then counted at 24 hours post-treatment while the number of 1st instar nymphs that successfully hatched was assessed at 7 days post-treatment. At the 24 hour count, nearly all adults and all nymphs were deceased and zero 1st instar nymphs successfully hatched from treated eggs. 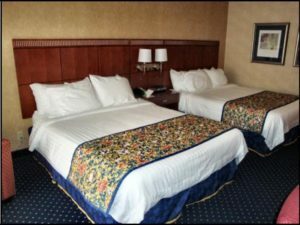 A field study was conducted to assess the efficacy of a combined Cryonite/diatomaceous earth treatment against bed bugs infesting a hotel room. 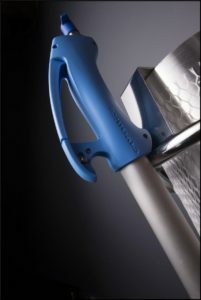 Each item of furniture or area found to be infested was treated with two slow passes of the Cryonite application Lance. A second application was made after the CO2 dry ice snow evaporated. The treatment required approximately ½ cylinder of liquid CO2 (~5 kg of CO2). Diatomaceous earth was then applied to all cracks with bed bug activity. No live bed bugs were discovered during follow-up inspections at one day and one week following the Cryonite/diatomaceous earth treatment. Cryonite proved highly effective in controlling poultry mites in poultry houses. Treatment with Cryonite was significantly more effective than treatment with insecticides commonly used to control poultry mites. A bread oven infested with sawtoothed grain beetles, Oryzaephilus surinamensis, and cigarette beetles, Lasioderma serricorne, were treated with Cryonite. The insects were located in lumps of bread crumbs underneath the oven. The test resulted in a significant reduction in beetles despite new raw material continuously flowing through the factory. This test was conducted in the packaging room of a large potato processing plant where larvae of Indian meal moths, Plodia interpunctella) were found. Cleaning alone failed to eliminate all of the moth larvae in the room so Cryonite was applied to all areas of activity. The treatment resulting in total mortality of larvae present and after two weeks, the room was still free of larvae and adult moths. 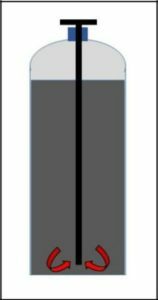 Cylinder without dip tube (left) takes CO2 gas from the top of the tank while the one with a dip tube (right) takes liquid from the bottom. Cryonite only works with liquid CO2. Question: My Lance isn’t working. Can I fix it myself? Answer: DO NOT attempt repairs yourself! All repairs should be completed by authorized Cryonite personnel. Email Customer Support at info@ cryonite.com for help and details. Question: Snow is not coming out of the Lance. What’s wrong? 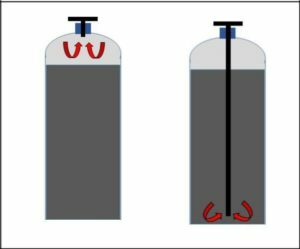 Answer: Most likely, the CO2 cylinder tank is not equipped with a dip tube. A dip tube is essential for proper functioning of Cryonite. A certain amount of CO2 gas is found at the top of all CO2 cylinder tanks. Without dip tube, only CO2 gas — not liquid CO2 is entering the Lance. The Lance converts the liquid CO2 into the dry ice snow. Check with your local gas supplier that you are supplied with the right type of CO2 cylinder. Question: Why do I have a gas leak at the cylinder connection? Answer: Check if the washer ring is in place and in good condition. The washer ring stops the hose-bottle connection leaking. If the ring is damaged or missing, replace with a new ring. Question: Why does the connection get cold? 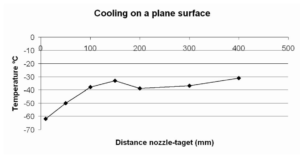 Answer: A small amount of turbulence occurs within the Hose resulting in slight cooling of the connection, but this cooling has no effect on the production or quality of the dry ice snow. Question: I can not connect the Lance to the hose! Answer: The Hose has likely been connected to the cylinder and the cylinder valve already opened. The pressure in the Hose prevents successful coupling between the Lance and the Hose. 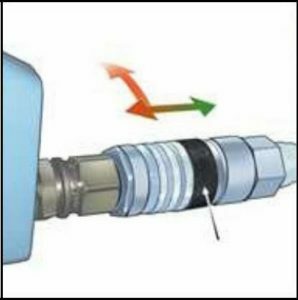 Solution: Close the valve of the cylinder, release the pressure in the hose by unscrewing the Hose nut by the cylinder about half a turn. When the gas pressure has been vacated, retighten the nut. Connect the Hose to the Lance, and reopen the valve. Question: When should I use the high speed Jet Nozzle? Answer: Only when treating large cracks, deep cracks, or voids. The standard nozzle produces a higher quality dry ice snow containing the optimum ratio of dry ice particle sizes. 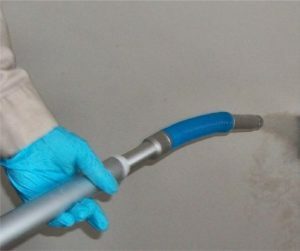 The Jet Nozzle is also better for cleaning purposes, such as removing moth webbings or blowing dust and debris from cracks where is can be cleaned by vacuuming. Question: When using the Jet Nozzle, it sometimes freezes? Answer: The high speed Jet Nozzle is NOT meant for continuous use. Action: When this occurs, wait for 20 to 30 seconds or until the snow/ice has evaporated, then try again. Question: Why does the snow stay so long on the surface? Answer: This can have several causes, including (1) the dry ice snow layer is too heavy or thick, or (2) the surface being treated is providing an insulating effect. With insulating materials (e.g., carpeting, food materials such as flour), the dry ice snow takes longer to evaporate. When the dry ice snow layer takes longer than 30 seconds to evaporate, some insects may survive the treatment. Question: Can I apply Cryonite on any surface/material? Answer: For the most part, yes, you can use it on almost every type of material. Items you should NOT treat include light bulbs, smoke/CO2/CO detectors, and fire suppression systems. 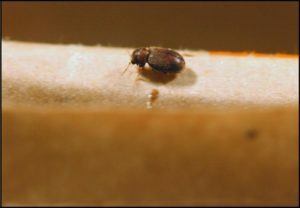 Some Pest Professionals have reported that Cryonite can negatively impact some types of memory foam used in mattresses and pillows. Some extremely thin materials may also be affected by dry ice snow. If in doubt, apply to a small, inconspicuous test site to determine any reactions with the surface. Question: Does the surface get wet when applying Cryonite? Answer: No, the CO2 snow is dry ice which evaporates directly into a gas without leaving moisture behind. 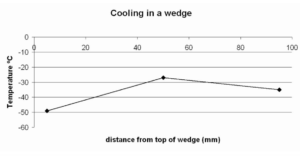 When the treated surface cools; however, moisture in the air may condense of the surface. Any moisture created by condensation will quickly evaporate as the surface warms. Question: Can I use it on electric equipment? Answer: Yes. Cryonite is safe to apply onto electric equipment but avoid direct application to electronics circuits and components. Moisture resulting from condensation can have negative effects on some electronic components. To be safe, disconnect/unplug electrical appliances. Question: Do I always have to use the Grounding Cable? Answer: In most cases he Grounding Cable is not necessary. Use it when applying Cryonite around electronics (integrated circuits) as these can be damaged by a static discharge. Question: Can anyone use Cryonite? Answer: Typical pesticide regulations should not apply to Cryonite; however, consult your state’s regulations to be certain you remain in compliance. Any person who uses the Cryonite equipment should receive training using this manual and other Cryonite training materials before using Cryonite in the field. Question: How cold does the snow get? Answer: The dry ice snow emerges from the Lance at -110°F (-78.5°C). The temperature of the target surface can drop — depending on the application, the type of surface and other circumstances — to -20° to -40°F (-30° to -40°C) and is cold enough to kill all developmental stages of insects or mites. Care should be taken to avoid direct contact with exposed skin and eyes during application. 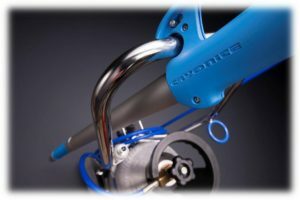 Question: How heavy is the Cryonite equipment? Answer: The Lance weighs about 2 lbs (1 kg) and the Hose and Trolley about 26 lbs (12 kg). The weight of the CO2 cylinder depends on its size. An aluminium cylinder containing 20 lbs (~10 kg) of liquid CO2 weighs about 55 lbs (25 kg). Disconnect the cylinder from the Hose and Trolley prior to storing in the vehicle. For safety reasons, the cylinder combined with the Trolley is too much weight to lift together. Question: How much gas is left in the bottle? Answer: The only way to be certain, is to weigh the bottle. The empty weight of the cylinder itself (Tara) is stamped on the bottle. The last pound or so of CO2 in the cylinder cannot be used. Question: How long does a cylinder of liquid CO2 last? Answer: A 20 lb (~10 kg) cylinder of liquid CO2 will last for about 10 minutes of continuous application with the trigger fully depressed. Because application is performed with short bursts, usage of CO2 will vary depending on size of area and level of infestation. Question: How do I store the cylinders? Answer: Store cylinders at temperatures below 85°F (30°C) with ideal storage temperature being 60° to 75°F (15° to 25°C). Temperature is also important when transporting the cylinder because if the temperature in the cylinder exceeds 120°F (50°C), the safety release valve on the cylinder may open resulting in loss of CO2 gas. A hot cylinder can also affect the quality of the dry ice snow, such as affecting its rapid freezing properties. DO NOT leave the cylinder directly exposed to the sun (either outside or in the car). On full trigger depression, the Cryonite system uses about 2 lbs (1 kg) gas/minute. Dry-ice snow temperature is -110°F (-78.5°C). For lethal temperatures and times, consult the report titled, Combating pests by freezing. Inner diameter — 45 mm. Two 90° bends at 1.87 and 2.37 m ( 6.1 and 7.8 ft). Opening — 1mm, 100 mm deep (0.04 in, 3.9 in).